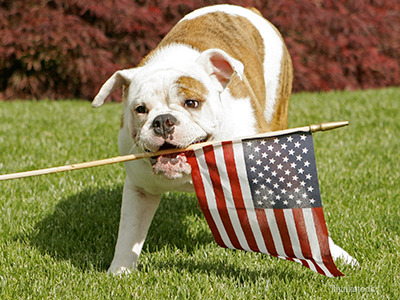 Dr. Ruth MacPete has some tips to help you keep your pet safe and happy this 4th of July. For more from Dr. MacPete, find her on Facebook or at www.drruthpetvet.com! The 4th of July is known for apple pie and BBQ’s, but even delicious holiday food can be hazardous for your pets. Keep your pets away from hot BBQ grills that can easily burn them, especially if they are tempted by what’s cooking on the grill. Animals should never have access to chocolate or alcohol. Bones, except for those specially treated and intended for canine consumption, should also be avoided. Poultry bones can splinter and get lodged in the gastrointestinal tract. Ham and beef bones can break teeth or cause intestinal obstructions. Though tempting, and always appealing to dogs, you should avoid giving your pet leftovers. Not only can this lead to obesity and encourage the annoying habit of begging, it can cause a pancreatitis attack. Pancreatitis is an inflammation of the pancreas usually caused by fatty foods. It is a serious condition that can be fatal if untreated. Though most of us consider fireworks to be the highlight of the evening, many pets are terrified of them. The bright lights and loud noises can unnerve pets and frightened animals will often escape in order to get away. Runaway pets can become lost or get hit by a car. To keep your pets safe and stress-free during a fireworks display, be sure to keep them indoors, preferably in a secure and comfortable room. Give your pet his favorite toy or a new chew toy to keep him distracted. Turning on the TV or radio can also help drown out loud and scary noises outside. If you have a pet that becomes very stressed or agitated by fireworks, despite your best efforts, speak with your veterinarian about medications that may help. There are a number of medications available to help decrease anxiety and relax your pet. Your veterinarian will determine which medication is appropriate. You can also try an over-the-counter product such as DAP® or Feliway® to help decrease stress in your dog or cat, respectively. All of your pets should have collars, ID tags and microchips, even indoor-only cats. A door or gate could be left open accidentally during 4th of July BBQ, or your pet could escape if he becomes frightened during a fireworks display. Collars, ID tags and microchips are the best way to ensure that if your pet gets lost, he will be returned to you. What should you do if your pet gets lost? Walk or drive around your neighborhood to look. Be sure to call out your pet's name, but he may not come to you if he is frightened. Contact your local shelters and call nearby veterinary clinics as soon as possible. Make flyers with your pet’s picture and post these around the neighborhood, in local pet stores and veterinary clinics, and around retail stores with high foot traffic, like grocery stores. Follow these tips so that you and your pets can have a safe and fun 4th of July!